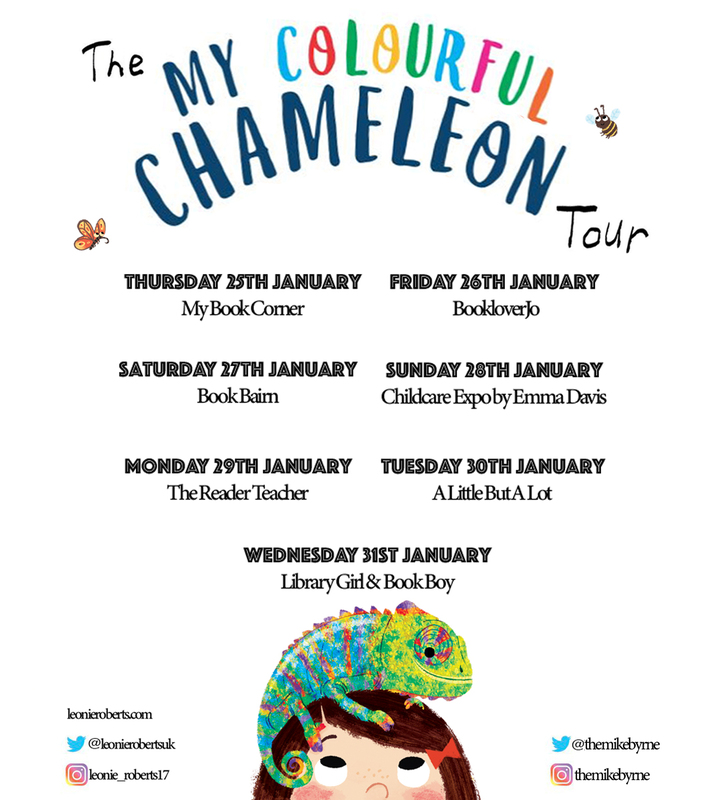 I often get nervous about agreeing to take part in blog tours because we only ever review books on the blog that BookBairn or The Wee Page Turner (or sometimes me!) really truly love. It's our guarantee of quality to you. But I needn't have worried in this case because BookBairn truly enjoys reading (and reading and reading) 'My Colourful Chameleon' by Leonie Roberts. This lovely book tells the story of a little girl and her pet chameleon who just keeps disappearing. Her mum thinks her beloved pet is a pest when they lose it on a daily basis because, of course, it just keeps changing colour. Quite frankly, mum has had enough and she wants to get rid of the chameleon for causing so much trouble. But when she takes her chameleon to school for show and tell things go from bad to worse and the teacher thinks it's trouble too. So they take the chameleon to the vet who reveals to the parents the natural instincts of a chameleon. So will it get to stay? Written in delightful rhyme this is a lovely read aloud story and little ones will enjoy spotting the colour-changing chameleon on each page (and grown ups you will enjoy hearing your little ones attempt to say 'chameleon'). The illustrations are simply adorable and the changing coloured chameleon is irresistible - why wouldn't you want to keep him? BookBairn is now fairly insistent on a pet chameleon! A wonderful book that we were lucky enough to have been sent two copies of by mistake so look out for the competition on our Instagram account. We were lucky enough to get to know Leonie Roberts over the last few months and she was kind enough to answer some of mine, and of course BookBairns questions. Where did you get the idea for My Colourful Chameleon? I was living and working in Italy at the time and one day I was walking home in the sunshine and the idea just popped into my head. I had to rush home to get it written down. I would have Oi Frog by Kes Grey, Be Brave little Penguin by Giles Andreae and The Princess and the Christmas rescue by Caryl Hart. I’m sure there are writers who have inspired you, can you tell us a few that you like the most? We know you love Roald Dahl already! I would say that Jill Murphy and Giles Andreae have inspired me the most because I never get tired of reading their work. In terms of learning about rhythm and rhyme of course I have studied the fabulous books of Julia Donaldson.My favourite of hers is The Smartest Giant in Town because I like the singing part. We love the illustrations in the book - how did that collaboration with Mike Byrne come about? I submitted my story to the publisher and then it was their job to match the story with an illustrator. I was very very happy that they chose Mike as I love his style. We haven't met in person but I hope that one day we will get the chance to. What are you working on next? Can you give us a sneak peek into your next story? At the moment I am working on two non-rhyming picture book stories. They involve dinosaurs and aliens. I am also trying my hand at writing for older children. "We have a rabbit. He doesn't change colour. He is black. Do you have a chameleon?" No I don't have a chameleon because I found out that they are quite tricky to look after and that they don't really like to be touched. I have a dog called Chester who loves to be patted and he snuggles up with me on the sofa. My favourite colour is blue. I think that this is why most of my clothes are blue. I like most animals but my favourite animals (apart from dogs) are giraffes because they have lovely faces. "The chameleon is good at hiding. I am good at hide-and-seek. Are you good at hide-and-seek?" I used to be good at hide and seek but I don't think there are many places that I could hide any more because I am fairly tall now and can't get into small spaces. Thank you for Leonie for joining us and answering our questions! To read the other blog posts in the tour, check out the banner below to find out when and where to be (and I'll also be sharing on our Twitter). And don't forget to keep and eye out for our competition! *DISCLAIMER We were sent two copies free for review purposes, words and opinions are our own. And we are going to post out the extra copy to one lucky UK-based winner. Great questions BookBairn and the search for a pet (toy) chameleon is now on! Rather you than me! She wants an orange one. Over 85 years ago my mum wished I was like a Chamelon and disappear, do you ever feel like that! Nope! And I'm sure she didn't really! No holding a toddler back! Looks like a great book and fab questions. I'm sure you will read it soon! Thanks! BookBairn loves this one! I'm intrigued to read the book as I'd really like to know if Leonie found a word to rhyme with chameleon! She didn't rhyme it I'm afraid! But have you read Neon Leon? I know! It's funny how it works but gives me hope that you can write books anywhere!